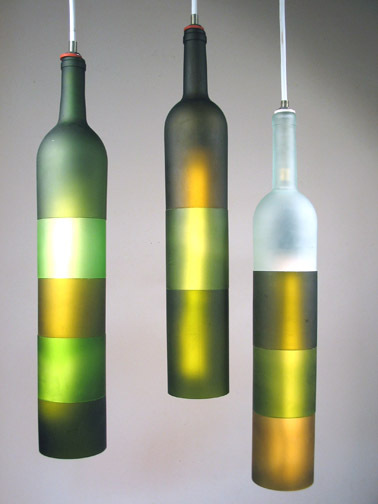 Mix and Chic: Cool products alert- Gorgeous recycled lamp bottles! Cool products alert- Gorgeous recycled lamp bottles! Look what I found while browsing the internet yesterday. These hanging lamp bottles are absolutely cool, unique, stylish and fun! It certainly delivers a certain wow factor and makes you want to do a double take! These mesmerizing lamps will look amazing in any swanky bars, trendy bistros or chic restaurants. It will be a wonderful addition in a residential property, too. I can imagine these lamps working very well in a very chic dining room with moody grayish walls or in a very modern breakfast nook with stark white walls. It will even work in a mini bar if you have one at home. By just looking at these beautiful lamp bottles, it's hard to believe they are recycled because they looked so seamless. These earth friendly products certainly worth another look. The talented designer/artist, Jerry Kott of the above products also made these very cool decorative vase bottles using similar method and designs. Please check out this website: www.jerrykott.com for more of his other interesting products.